Long a favourite garden plant Pelargoniums come in many species and cultivars are readily available for sale from online from mail order nurseries. Relatively easy to grow and include, Regal, Zonal, Ivy leaf, Deacons, Angels, Staphs and sweet scented. For growing in the garden or in pots use a humus and compost rich soil or potting mix. Potash will help increase flowering, overfeeding may encourage a little to much leaf growth. What’s the difference between a Pelargonium and a Geranium? They are related, but they are different. Generally speaking Pelargoniums are tender perennials, Geraniums are hardy perennials. 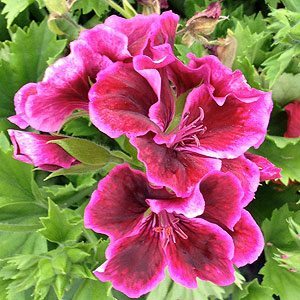 Plants sold as “Ivy Geranium”, “Scented Geranium” and “Zonal Geranium” are actually Pelargoniums. Its the flowers that are ‘Regal’. Regal varieties are bushy with lots of large flowers. Summer flowering, they do not like frosts. Extensive collection of Pelargoniums and some large flowered Chrysanthemums. Mail order plants to gardeners and collectors, catalogue available. Mail Order. Regals a speciality, also zonals and ivies – hardy plants in Tubes. For descriptive catalogue send 4 x 60c stamps. To all states – Air Express free – mail order. Retail and wholesale Visitors phone first. 50 cuttings for $50. Ask about large shipment, new imports from UK exclusively from WA only.